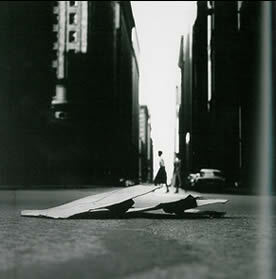 Ray Metzker was born in 1931 and is known for his work in cityscape as well as landscape portraiture. I decided to pick some of his cityscape portraits, as I find them more interesting. 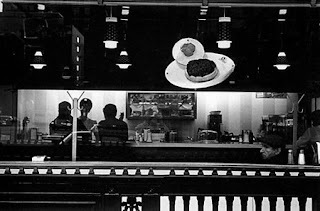 In the first photo, from the Chicago Series, I was originally drawn in to the photo to try to figure out what the objects in the foreground center of the photo are. The women walking in the background originally appeared to be walking on these objects from a distance. After further study, these ambiguous objects appear to be trash cardboard pieces laying on the road. I found it very interesting that the photographer was able to use these simple pieces of trash in such an interesting way. Without the distorted focus, the picture would not be as successful. In "Philadelphia 1964", I found it interesting how Mr. Metzker was able to use a flat horizontal viewpoint and use the reflective surface of the city in the background to create a deeper space and even an atmosphere and feeling in this photograph. Love these photos, and thank you for putting the names and dates!